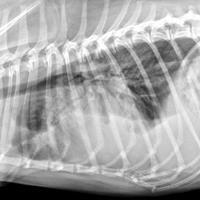 First examine thoracic radiographs from a coughing dog, then Alan Lipman, DVM, DACVR, will explain his interpretation. 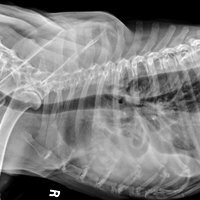 A fourteen-year-old female spayed Labrador Retriever presented with a six-month history of a progressive cough, exercise intolerance and weight loss. Based on her presentation, the primary differentials were laryngeal paralysis and/or primary pulmonary disease. A ventrodorsal and right lateral projection of the thorax were taken. Radiographs demonstrated a moderate quantity of pleural effusion, which was more voluminous on the left side. The effusion made evaluation of the cardiac silhouette and pulmonary vasculature limited. There was also expansile lysis of the left fifth rib with an adjacent soft tissue mass effect. The majority of the ventral aspect of the left fifth rib was absent on the right lateral projection. An aggressive rib tumor was suspected based on this appearance. No evidence of pulmonary nodules were identified; however, the evaluation was somewhat limited due to presence of effusion. 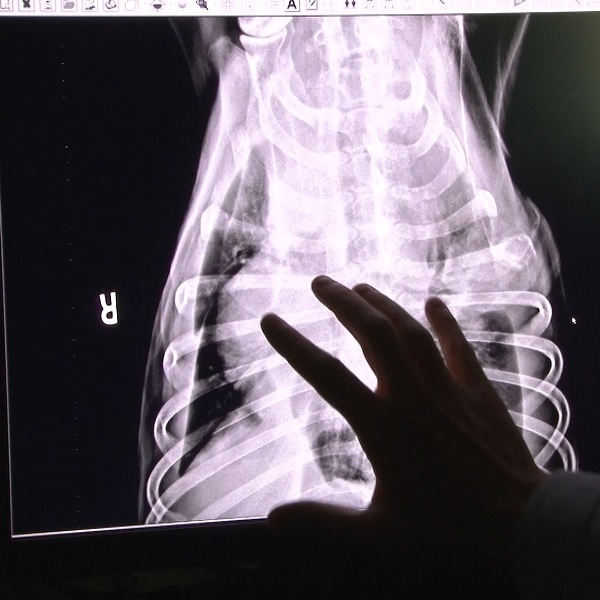 The majority of aggressive rib tumors are diagnosed as osteosarcoma or chondrosarcoma. Osteosarcomas are very locally aggressive with a very high potential for metastasis to the lung. There is often a large soft tissue component to these rib tumors which can make them radiographically similar to a primary pulmonary mass. Often, these rib tumors are entirely lytic, which makes the radiographic diagnosis more difficult. Pleural effusion is often a concurrent finding. When pleural effusion is evident radiographically, primary or metastatic rib tumors should be included on a list of differentials as part of a methodical approach in determining the cause of the effusion. Cytologic evaluation of the mass with sonographic guidance is recommended for definitive diagnosis.